There are two things trending about Deng Lun, and the whole thing's pretty funny. Jordan Chan recently started following @denglun on instagram. Assuming that it was his official account, Jordan Chan left a comment, "Jia you..... thinking of you." The thing is, Deng Lun doesn't have instagram so Jordan Chan basically followed the wrong guy. The innocent mistake has become a popular hashtag on weibo. It seems that Deng Lun caught wind of what happened as he's just opened an instagram account today with the username @allendeng1021. He writes, "Have kept everyone waiting for too long, I am finally here. @jordan_chan_36." He also cheekily sends a screenshot of it to Jordan Chan to say that it's for real this time. It seems random that these two are friends. 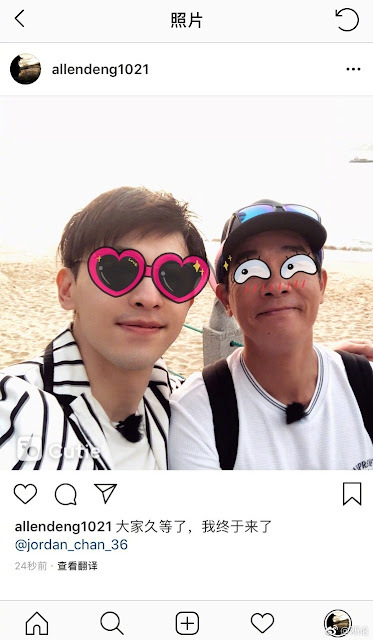 One's a 51-year-old Hong Kong actor and singer while the other's a 25-year-old Chinese actor. It turns out that both were together in Where Are We Going, Dad? Season 5. 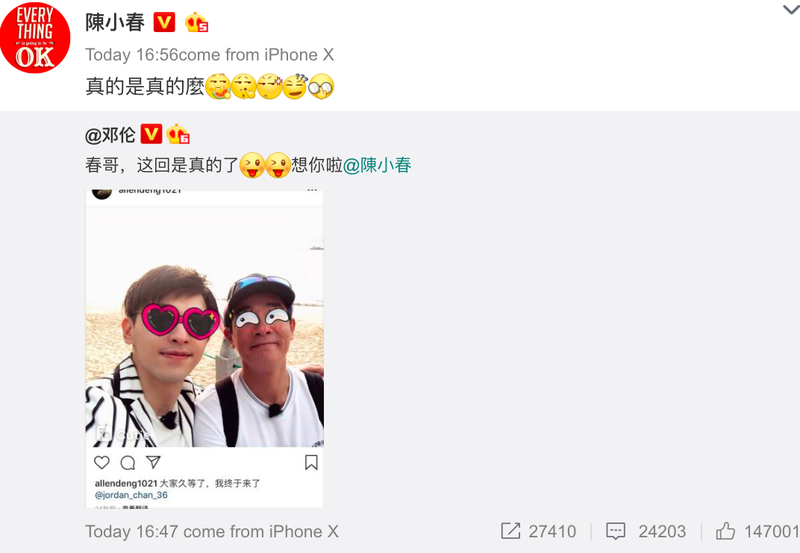 Labels: Celebrities , Deng Lun , Jordan Chan , Where Are We Doing Dad? It is pretty funny. 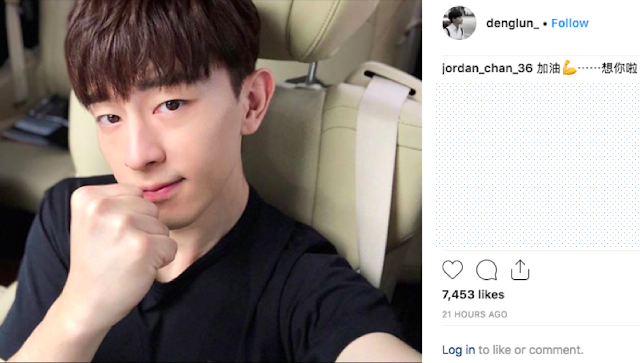 But, thanks to Jordan Chan, we now have Deng lun's instagram account to follow. It just made my day. I watched today episodes of HSALF. The show is almost over, his screen time is still so little as a male lead. I feel bad for him. Hope he'll have a better drama soon. HSALF is such a hot mess. I don't know if u notice it or not, it already feel rush for the main couple in the the end, so can't expect anything anymore. Just can't wait for his next drama Haitang's Rouge shines through in the rain with li yi tong, hope it will air soon. Though i don't like Li yi tong's face, i feel like there is something wrong with her eyes, i don't know how to describe it. Maybe it's just me. But her acting quite good in bloody romance. Looking forward to their chemistry. Watch him post just one post then forget all about having an Instagram.